A recent conversation with some fellow visualization folk led me to question my own notion of what the visualization space should look like and how it should get there. Perhaps the real opportunity is less grandiose (and presumptuous) and more down-to-earth: consistently working towards incremental understanding as a general goal rather than becoming fixated on solving for the larger perceived “problem.” Shedding some sense-making responsibility for visualization isn’t necessarily a surrender to the chaos and complexity that seemingly threaten to consume it. A measure of detachment acknowledges that other productive efforts are happening organically and have the potential to generate enough signal to cut through the noise. In this sense, the visualization space will ultimately become what all of its participants make of it; each contribution exists for the others to respond to, share, build upon, or rethink entirely. And the varied roles active within that ecosystem will shape the dynamic and tenor of discourse: teachers and students, leaders and followers, innovators and optimizers, sense-makers and trouble-makers. So maybe hard paved roads, guardrails, and traffic lights aren’t the real solution to traversing the rocky terrain of visualization, but at a minimum, some balance is needed — enough structure and practical/theoretical basis to give the space substance as well as enough openness to allow new thinking and innovation to occur. To borrow from the hiking world, it might be a shared community effort that guides the way, much like the cairns that line mountain hiking trails. 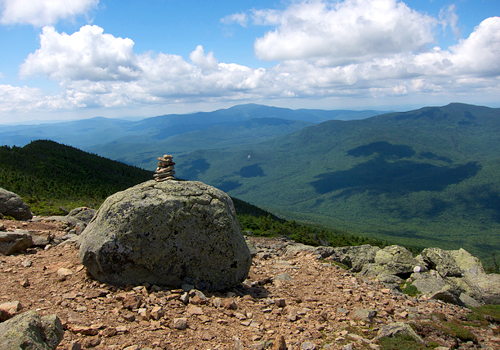 Cairn built atop a boulder on a hiking trail in New Hampshire. Photo by Michael Tsai on Flickr. These small mounds of rocks mark the safest path when weather obscures painted trail markers or when hazards are hard to see. The piles aren’t always part of the design of the trail, yet they elegantly blend with the natural landscape while clearly showing the way. The success of cairns depends on many hikers doing their part by building them where they’re needed, adding stones to make the pile higher, or rebuilding them when damaged by the elements. Similarly, if enough visualization practitioners (from data viz, visual thinking, information design, scientific viz, etc), researchers, and others create and build upon existing knowledge bases (such as blogs, discussion groups, courses, events, etc) and collectively raise awareness of genuinely useful resources that advance understanding, the “right” paths might emerge naturally in time. Of course, in this revised vision, all possible paths are available — it only depends on the individual to make sense of the options and decide on the best path forward. Thank you for this! The metaphor of wayfinding, guided by the cairns of collected work product, is apt. 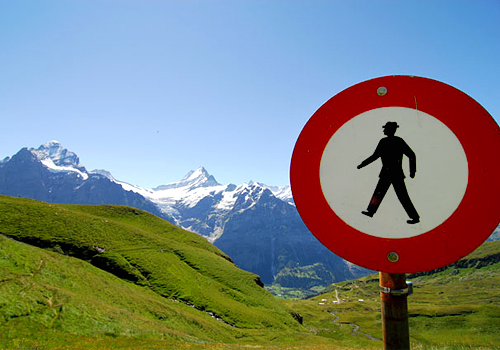 The concept of a signal strong enough to cut through the noise is also helpful. Thanks for commenting, Tom. You present an interesting extension of the cairn metaphor, specifically an ordered (geometric!) structure to maximize the impact of each contribution. It’s easy to assume that all the centers of activity in visualization create a self-organizing system organically, but as you suggest, some measure of efficiency and order would be beneficial. Community/network members would be more willing to build those cairns if they had a modicum of confidence that their efforts were to be equitably transmitted into an intelligent system of cairns. While any one layer of pathways could optimize vector patterns, we need more dimensions to distill and bring order to the infinite pathways crisscrossing our digital universe. I see your cairns as analogous to the “compression islands” that organize and power R. Buckminster Fuller’s geodesic “Tensegrity” structures.